Some modelers may be unaware of just how quickly N Scale made the trip to North America. 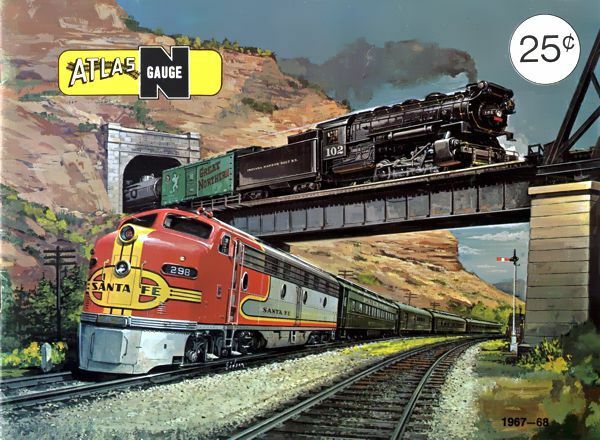 Indeed, a few still claim that Aurora Postage Stamp Trains marked the debut of N Scale in the United States in 1967. While this is most assuredly incorrect, the myth persists, likely due to Aurora's broader marketing. Actually, N Scale arrived in the US soon after it was born. 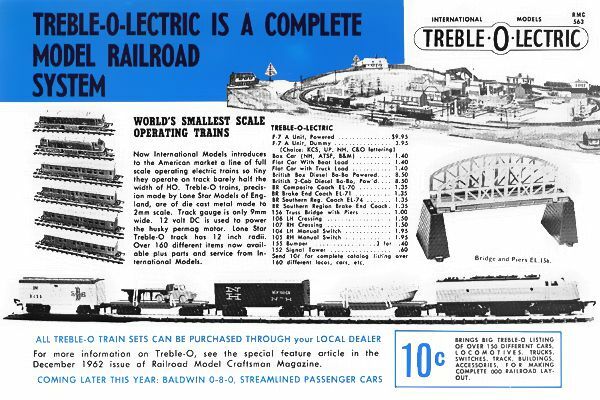 By 1962, Lone Star's Treble-0-Lectric line was being imported by two companies, International Models, Inc. and Montgomery Ward. And it was late 1962/early 1963 when Charles C. Merzbach Company Inc. of New York City began importing Arnold Rapido. Merzbach was in fact Arnold's official US agent until around 1967, although they continued selling it well into the 1970s. In 1965, Nathan R. Preston of Chicago began importing practically anything he could get his hands on, including Kibri, KleiWe, Peco, Preiser, Sommerfeldt, Trix and more. A year later, Con-Cor International introduced Sekisui of Japan (now known as Kato) to the US. In addition to representing many other domestic dealers and striking co-branding agreements with a number of overseas manufacturers, Con-Cor began commissioning Sekisui to produce North American models. Then there was Atlas Tool Company in New Jersey, who entered the market in 1967. Atlas chose to partner with Rivarossi for locomotives, passenger cars and track, Roco for freight cars, Pola and Faller for structure kits, and even Preiser for US-styled figures. Atlas aggressively expanded their product line to become one of the most comprehensive of any North American importer, and remains a leader in the scale today. 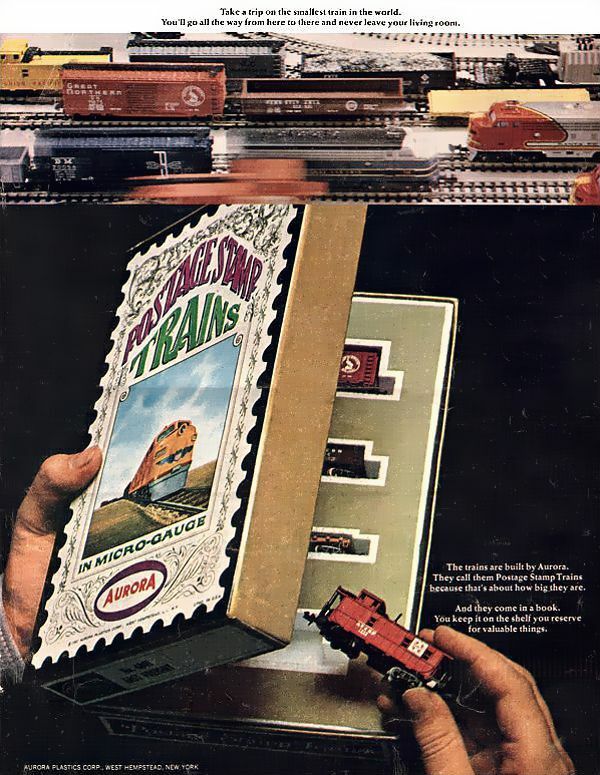 That same year, Aurora Plastics launched Postage Stamp Trains with considerable fanfare, including full-page color magazine ads and even a television spot; Aurora's line included Trix locos, Roco freight cars (branded for Trix), and Faller structure kits and bus system. Meanwhile, Aurora's rival Revell picked up the Arnold Rapido line. And AHM began haphazardly importing bits and pieces from a half-dozen manufacturers and half-heartedly promoting them. Bachmann's N Scale debut came in 1968; the Philadelphia-based toy company had the distinction of being the first domestic manufacturer of N Scale, although their products were all made in Hong Kong. More importers/rebranders followed, including Boyd Models and Model Rectifier Corporation. Plus, by 1969 there were countless domestic retailers large and small selling just about everything made in N Scale. From here on out, N Scale continued to grow and prosper, although product lines were being bought, sold, discarded, lost, traded or bootlegged by companies and individuals at an increasing rate. There was much palace intrigue along the way, too, but this, dear reader, marks the end of our journey following the birth of N Scale. I hope you enjoyed the ride. All images copyright per their respective owners; no infringement intended.